The new HO Intercooled ProCharger system for Chevy’s C6 Corvette began shipping in August 2005. With the coolest charge air temperatures and lowest parasitic load in the industry, this system produces over 600 horsepower on stock LS2 motors with only 6 psi of intercooled boost. The ProCharger C6 supercharger system is 100% complete and is also 50 state legal (EO D-365-6). A tuner kit, which excludes the fuel injectors, fuel system and computer tuning, is also available, and is otherwise identical to the HO Intercooled system. 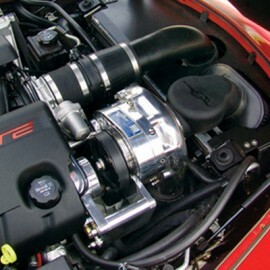 Stock or modified LS-engines, ProCharger is The Ultimate Corvette Power Adder. *** Did you find this product cheaper somewhere else?